Trying to decide between Sun Basket vs Hello Fresh? We can help! HelloFresh is less expensive than Sun Basket. It’s great for individuals and families looking to make dinnertime less stressful and time consuming. Sun Basket uses way more organic ingredients. It also offers over three times as many menus, including Paleo, Mediterranean, Carb-Conscious, and more! We'll also help you save money on whichever service you choose. With that, let’s dive in! Here’s the big picture (full reviews below). Avg. U.S. customer review on Trustpilot. Below you'll find more in-depth information about each service, starting with HelloFresh. HelloFresh is one of the largest meal delivery services in the world. It focuses on making dinner time less stressful by shipping step-by-step recipes and pre-portioned ingredients right to your home. The company offers 3 plans: A classic menu, a family plan (with more “kid-friendly” meals), and a vegetarian plan. Compared to deciding what to cook, making a shopping list, going to the grocery store, and measuring and prepping each ingredient, HelloFresh can be a huge timesaver, and it’s less expensive than many competitors, including Sun Basket. Another key difference of HelloFresh vs Sun Basket is that HelloFresh operates in 10 countries: the United States, Canada, the United Kingdom, Germany, Belgium, Luxembourg, the Netherlands, Australia, Austria, and Switzerland. Sun Basket is only available in the United States. A popular question many people have about HelloFresh is “Can I pick my meals?” The answer is “Yes” on the Classic or Family Plan. After you complete the signup process, you can follow this walkthrough to select your meals. Or, if you want to save time and you think trying new meals sounds fun, HelloFresh will happily make the decisions for you. If you ever need to skip a delivery, that’s easy to do inside your account. You can also cancel your membership any time prior to a weekly cut-off (when another box of food is shipped to you). Unlike Sun Basket, the majority of Hello Fresh’s ingredients are usually not organic. The service’s goal is to help people easily prepare well-balanced, home-cooked meals. HelloFresh’s uses all-natural meats. The company’s poultry suppliers certify that their animals are antibiotic-free and hormone-free. The pork suppliers have certified their animals are also hormone free and get the best treatment possible. HelloFresh works with the Monterey Bay Seafood Watch program to ensure all the seafood they serve is rated "Green/Best Choice" or "Yellow/Good Alternative." You can’t substitute any ingredients in your HelloFresh shipments, but you can choose your meals, which makes it easier to work around food allergies. And since ingredients are packaged separately and clearly labelled, you can also omit or substitute ingredients at home. You can recycle HelloFresh’s shipping and packaging materials with these instructions provided on their website. 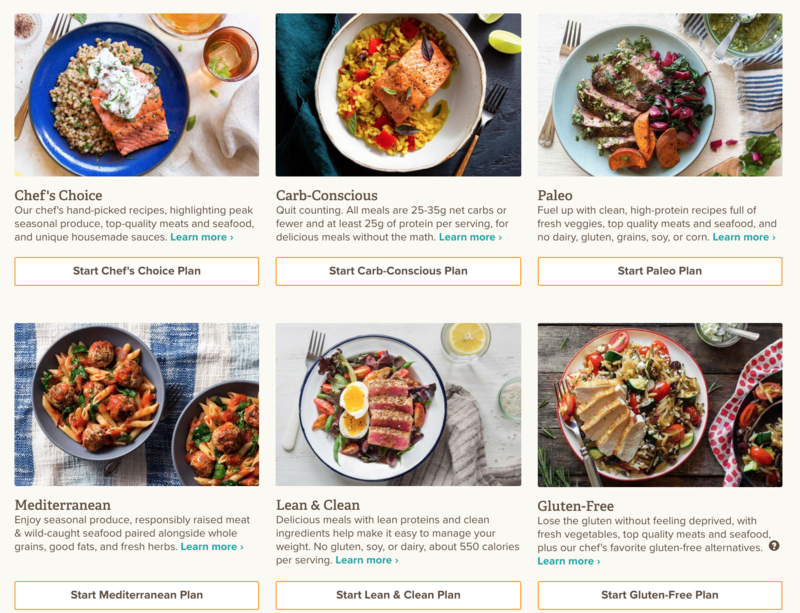 HelloFresh offers three plans you can choose from. The Classic Plan: Serves 2 or 4 people. On this plan, shipping costs $6.99 - $7.99 depending on how many recipes per week you choose. It's factored into our "total cost per week" column. 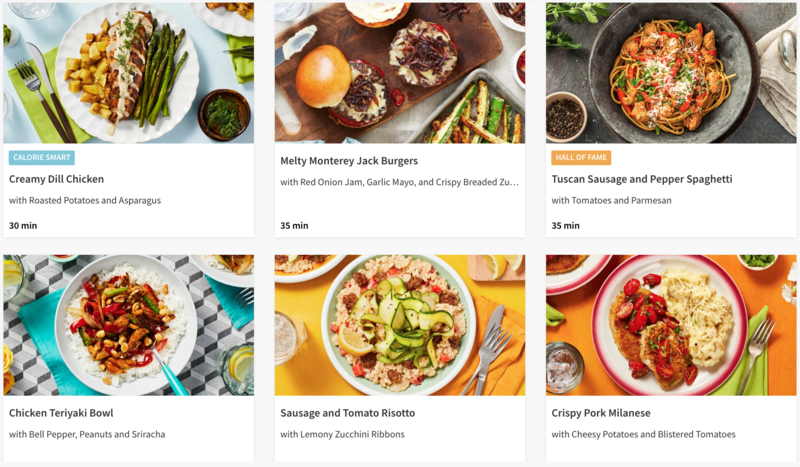 Whereas HelloFresh is designed to please mainstream families, Sun Basket was founded to serve more discerning diners, especially those trying to stick with a specific diet. * Although the Gluten-Free meal plan does follow a gluten-free diet, the meals are prepared in a facility that also handles wheat. Due to the risk of cross-contamination, Sun Basket says these meals are still not suitable for people who deal with severe gluten intolerance. Sun Basket is also a USDA certified organic handler, and almost all of their produce is organic. This is another key difference between Sun Basket vs HelloFresh, which uses much fewer organic ingredients. Sun Basket is a USDA-certified organic handler, and currently, over 99% of their produce is organic. They use organic milk, eggs, and yogurt. And all of their tofu is made from organic, non-GMO soybeans. Their meats and poultry are always antibiotic and hormone-free. On some recipes, Sun Basket even gives you the option to order grass fed, grass finished beef. Lamb and turkey are pasture-raised. Unlike HelloFresh, all of Sun Basket’s seafood is wild-caught (never farmed). Like Hello Fresh, Sun Basket’s seafood is always recommended as Best Choice or Good Alternative by the Monterey Bay Aquarium Seafood Watch® program. Sun Basket only works with ranchers and farmers who raise their animals sustainably. Fishermen use low-impact fishing methods (such as line fishing), and fisheries are certified by the Marine Stewardship Council (MSC), which is a leading authority in sustainable seafood. Sun Basket’s packaging is 100% recyclable and compostable. And the company even gives back to communities through Feeding America and local food banks, as well as employee programs. A great thing about Sun Basket is that the pricing is the same no matter what eating approach you choose. Shipping is $6.99 per order. Feeds 2 people and can be used on ALL of the meal plans (Paleo, vegan, pescaterean etc.). Feeds 4 people. You can choose between the Chef's Choice or Vegetarian plans. Hello Fresh vs Sun Basket — Which is right for you? After reading this head to head review, are you leaning toward Hello Fresh or Sun Basket? HelloFresh is cheaper, and focuses on helping you conveniently prepare balanced, home-cooked meals. Sun Basket offers more menus, more organic ingredients, and a few other premium features such as only using wild-caught seafood. Both companies are a more convenient way to get dinner on the table. We hope this article has helped you picked the option that’s best for your tastes, goals, and budget!